Less than two weeks after being suspended by The Sun over an unprovoked hatchet job in which he called Ross Barkley “the dimmest footballer” in England before comparing him to “a gorilla in a zoo”, Kelvin MacKenzie has done it again. 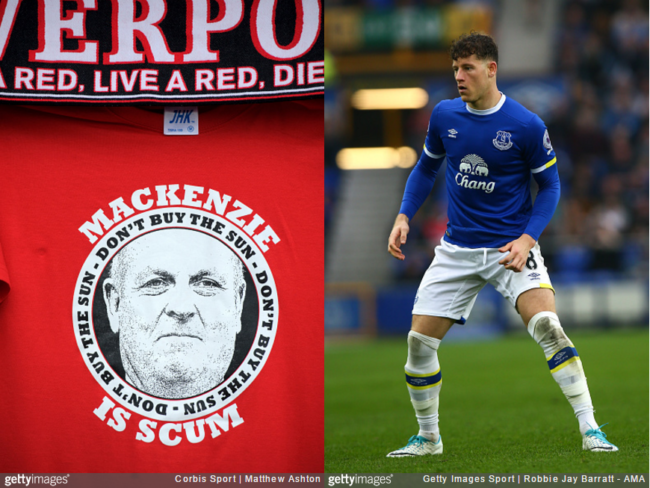 The column receives hundreds of complaints, with Merseyside Police treating it as a racist attack due to Barkley’s Nigerian heritage. Writing this time in The Spectator, MacKenzie has defended the article, dismissing the fallout of “Rossgate” as nothing more than “confected outrage” precipitated by his “enemies in the north-west”. MacKenzie also claimed that he received a text message from Trevor Phillips, former chairman of the UK Equality and Human Rights Commission (and, crucially, a man of non-Caucasian descent), shortly after the column was published. However, to his surprise, Phillips apparently got in touch to express his support for MacKenzie’s courageous opinion piece. When the confected outrage started over my Sun column about Everton footballer Ross Barkley I was not surprised to see a text pop up from Mr Phillips. I feared he would join the Liverpool bandwagon claiming I was a racist because I had compared the look in the eyes of Barkley with a gorilla. Actually I and every football fan I had ever met believed Barkley to be white. Unluckily for me, but luckily for my enemies in the north-west, that was not entirely true. It emerged that although Barkley looked white, his grandfather was half-Nigerian. The reality is that had I known of his family tree I would never have made the comparison, but since I am a columnist and not a researcher on ‘Who Do You Think You Are?’ I didn’t know, and have yet to meet anybody who did. Including the Sun sports editor. So, with hesitation, I read the text from Trevor Phillips expecting it to follow the line of such luminaries as Stan Collymore — presumably from a dogging site in Staffordshire — and Virtue Signaller of the Year, Gary Lineker. Almost unbelievably, MacKenzie then went on to explain that he couldn’t possibly be racist because, just weeks before ‘Rossgate’, he’d actually donated money to some local black children. When plunged into this kind of storm, deploying the ‘my best friend is black/gay/transgender’ option invites derision, but I thought the story of my will would be helpful. Predating Rossgate by a few weeks, I contacted the fundraising department of my old school, Alleyn’s in Dulwich, south-east London. If I left the school some money could they guarantee that 100 per cent of the scholarships would go to minority children? I had in mind African-Caribbean kids from the catchment area of Camberwell, Peckham and New Cross. They went away to check with the chairman of the governors and the head teacher. I was given the thumbs up and my lawyer is now drawing up the will. I tell this story because I am forced to, not because I want to. Another victory for Liverpool. We can’t bring ourselves to pick through this excremental tripe.